Discussions Magazine Music Blog: THE FUN BOY THREE/The Fun Boy Three CD reissue review! 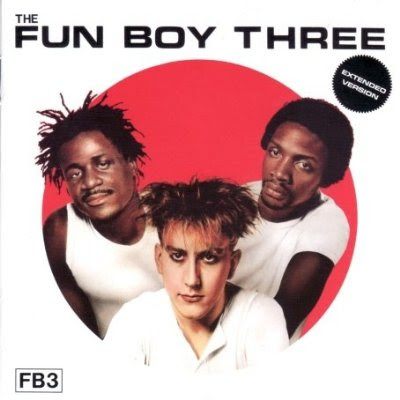 THE FUN BOY THREE/The Fun Boy Three CD reissue review! When Terry Hall, Neville Staples and Lynval Golding left The Specials just after their most successful single, "Ghost Town", nobody could predict what the trio had in store, musically. It was probably safe to say that Hall, Staples and Golding had no clear idea, either! But when the trio announced that they, as The Fun Boy Three, would continue as a recording unit, their future success was at least partially secure. Specials fans would certainly follow them on their journey, but they had to prove their worth first. The fact that only Golding played an instrument did not bode well for their future. Just a few short months after "Ghost Town" had left it's mark, "The Lunatics Have Taken Over The Asylum", the first FB3 single was released on an unsuspecting world. The song was unlike anything The Specials had ever recorded, yet it retained the ominous feel of "Ghost Town" without sounding anything like it. Terry Hall's voice was unmistakeable, which was oddly comforting, but it was still a total change of pace for the musicians. The track blended haungint keyboards, world rhythms, chanting and Hall's droll delivery sitting on top of it all. In short, it was wonderful! When the trio's debut album, The Fun Boy Three , appeared in 1982, not only was it unlike anything The Specials did, it was unlike anything in the Pop music charts, period! It was so far ahead of it's time that now, 28 years later, it is STILL ahead of it's time! The album is not Post-Punk, New Wave, Rock, World, Reggae or Pop, it does contain elements of all of those genres... and then some. The album is filled with different kinds of percussion, found sounds, chanting, piano tinkling, horns and other odds and ends not found on your normal Pop record. But the funny thing is, The Fun Boy Three is a great Pop record! The songs are catchy, although they don't rely on normal songwriting formulas. Repetition can sometimes be annoying, but not so here: there's never too much of anything and many of the songs demand an instant relisten just so you can make sure you process everything! The production is sparse and basic, although there are many unexpected things happening during the course of each track. Apart from the FB3, the album also features the first major label appearance of another trio, who would scale the charts a short time later: Bananarama, who provide backing vocals on a few tracks including the hit single "T'aint What You Do (It's The Way That You Do It)"
This expanded version of The Fun Boy Three features six bonus tracks including non-album B-sides and extended versions of "The Funrama Theme", "Summertime" and "The Telephone Always Rings"
In short, quite odd and quite brilliant.